How are we all doing today? Here's hoping it's a good day for you all. So I made a card for my Mum using my Clearly Besotted stamps, my Clarity letters and my Sue Wilson Bow die which I love. My Mum loves poppies as I do so I hope she likes my card. Why not join in with us and check out what the rest of the teamies have made. There is some fab inspiration from them too. I had a lovely day yesterday, I did nothing but craft. My arms are alot better so at least I can do some stamping. It was so good to play. That's all for today, I have my yearly mammagram appointment this afternoon at 1:09pm - weird time. I aren't having any problems, it's just due to my family history. Have a great day whatever you're up to. Sucha a beautiful card and a beautiful colour combo. Thank you for joining us at the Ribbon Girl, good luck and I hope you will join us again. 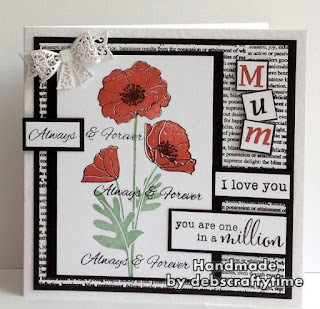 A beautiful card Debbie, pretty poppies and great design - I love all of the sentiments. I hope your appointment went well. What a gorgeous design. 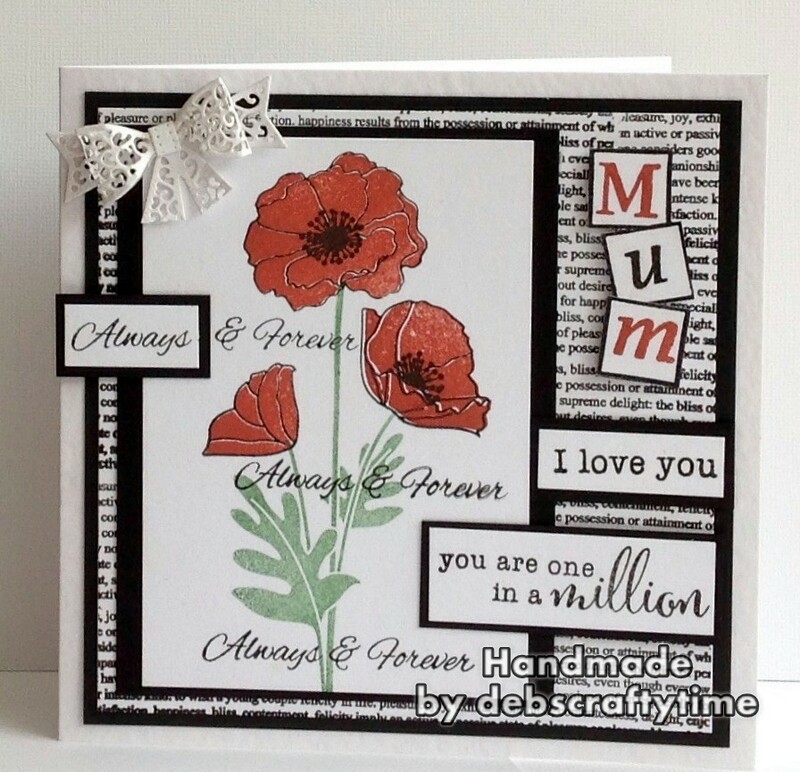 Love the colour combination and the poppies are so pretty, plus sentiments to melt any Mum's heart! I love the black red and white! Thanks for joining our ‘Personalize It’ challenge over at Incy Wincy Designs Challenge Blog!